Gardens in Avoca, Terrigal, Springfield, Wyoming, Forresters Beach, Lisarow, Matcham and Green Point have taken out honours in the 2017 Gosford District Garden Competition. 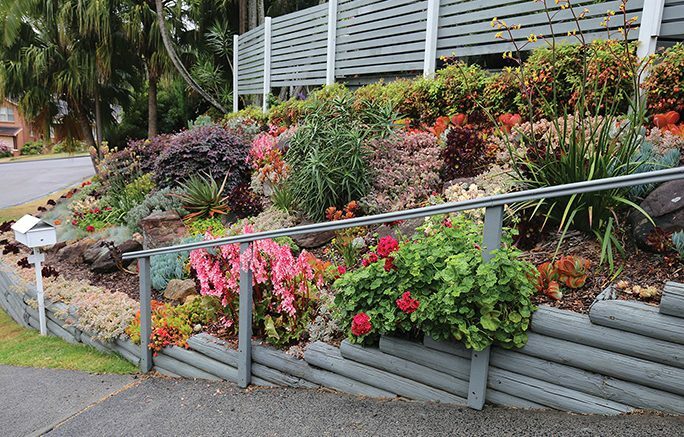 Garden of the Year was awarded to Ms Alva Bell of Umina. The best eco-friendly school garden was won by Empire Bay Public School (first) and Niagara Park Public School (second). Henry Kendall High school was awarded the Best Secondary School garden. The best edible residential garden was won by Ms Helen McGhie of Avoca with Mr Grant Bradly of Terrigal taking second place. Wyoming Eco Garden won the best culinary community garden. The best eco-friendly residential garden was also won by Ms McGhie with Mr and Ms Grant and Paula Bradly in second. For a full list of the prize winners see the competition organiser’s advertisement elsewhere in this newspaper. The formal presentation evening, held on Friday, October 27, at the Erina Centre, was attended by the 44 entrants, their friends and special guests. Special guests included sponsors, Ms Liesel Tesch, the Member for Gosford, Ms Anne Charlton, Labor candidate for Robertson, and Clr Rebecca Gale-Collins, representing Central Coast Mayor, Clr Jane Smith. Clr Gale-Collins congratulated the Gosford District Garden Competition committee on the success of the competition, the value it places on beautifying the environment of the area and the contribution it makes to the wellbeing of the community, by encouraging gardening. Before presenting the prizes, the President of the committee, Ms Dot Kite, gave a brief report on how the group running the competition was formed after the amalgamation of the Wyong and Gosford Councils, and thanked the Central Coast Council for their substantial grant to enable them to run such a successful competition. She specifically thanked Mr Glen Cannard, Ms Ainsley Whitburn and Mr Mikell Borg from the Community Grants section of Council. The committee also thanked all the business sponsors in the Gosford area for their generous support of the competition in the way of donations or gift vouchers which were used as prizes. Emphasis in the 2017 competition was placed on the general home gardener and those gardeners who have not entered a competition in previous years, Ms Kite said. This theme will be further encouraged next year. Schools were also encouraged to enter both in the Eco Garden classes as well as classes for the general school garden tended by students. “The Committee felt that eco gardening was the way of the future and should be encouraged in schools,” Ms Kite said. Five local schools entered, but it is hoped that more schools in the area will establish eco gardens and will enter next year. The judges, Mr Phillip Chown and Ms Jeanette Chown, from Sydney, made special mention in their report on how impressed they were with the enthusiasm and dedication of the students to the care of their compost, chickens and gardens, even in the dry and trying conditions that the area had been experiencing up to the time of the competition. Ms Kite said she thanked every entrant and said they were all winners for the work and devotion that they poured into their gardens.